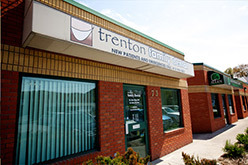 From routine cleanings and fillings to bruxism devices, Trenton Family Dental is equipped to handle all your dental needs. To help you understand your options, we’ve included descriptions of some of our leading services on this page. Your initial oral examination includes a visual examination, charting, periodontal probing, diagnosis and treatment recommendations. We will also take x-rays, which include the panoramic x-ray for proper diagnosis of the anterior (front) and posterior (back) teeth as well as the bite-wing x-ray series for proper diagnosis of proximal decay of posterior teeth.